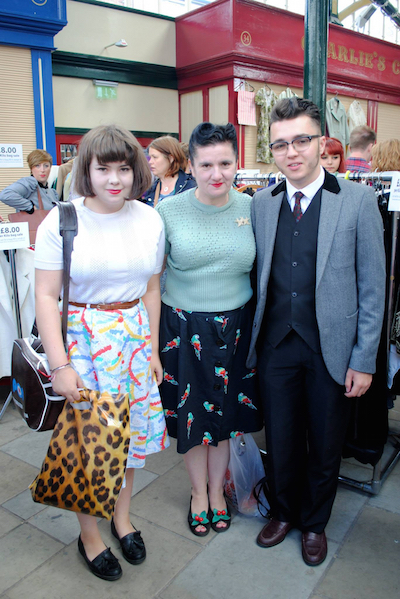 The Vintage Village Fifth Birthday Bash Fair! When: Sunday 13th September 2015, 10.00am to 4.00pm. Who would have guessed we would reach our fifth year of presenting the monthly Vintage Village fair here in Stockport’s picturesque Old Town? That’s half a decade, or one twentieth of a century, and a total of 60 fairs! If it was a wedding anniversary we would be looking forward to wooden gifts, but we don’t want presents - thanks all the same - all we want is to see you on our birthday! ✭ With our pals and special guests the 3 Graces Northwest Classic Car Club and their lovely glossy 1950s-60s motors AND the Girls Gone Rockin DJs! ✭ With a Random Gift Voucher Giveaway on the doors! If the egg-timer pings when you are at one of our two doors, you will receive a £5.00 voucher to spend on anything at the fair. ✭ With a Vote for your favourite Traders Vote! Take three voting cards, write the names of each of your three favourite traders at the fair - do this as you're browsing round, it will be easier! - and then give your completed cards to our door staff before you leave. We’ll count them all up and will be awarding the top three traders you voted for at next month’s fair. Optional dress code: 1950s-early 1960s party outfits to complement our special guests. 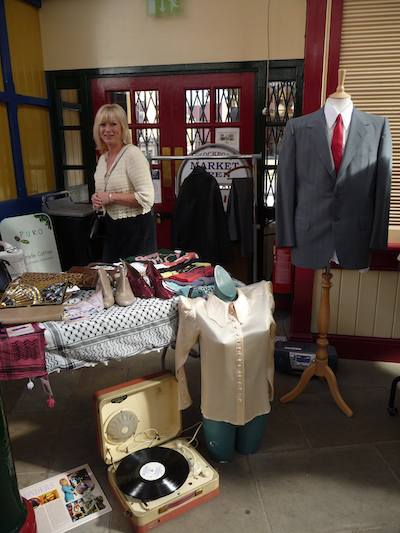 There's a fabulous plethora of vintage goods for ladies, gentlemen and the home, including apparel and accessories, jewellery, homeware, decor, furniture, luggage, textiles, record players, vinyl, toys, collectables and curiosities. Supplying essential refreshments will be the world-class, multi-award-winning Lord of the Pies, the amazing Nasi Lemak offering authentic Malaysian street food and Stockport’s coffee maestro Cafelito, with delightful sweet treats from our first Visitors’ Favourite Trader, the equally multi-award-winning Stuart Thornley Cake Design. And there's an exciting development at 20th Century Stores with the recent opening of 7 Park Street, a coffee shop and business hub plying its trade from the last section of the Stores. Proprietor Esther has rustled up a special high-concept menu for our fifth birthday - with dishes comprising five ingredients! French Press Coffee with speciality grounds from Ancoats Coffee Co. The magnificent McGanns! Snapped at our Third Birthday Bash, 8th September 2013. Sheila minding the Village Vintage Clothing stall at the very first Vintage Village fair, 12th September 2010. 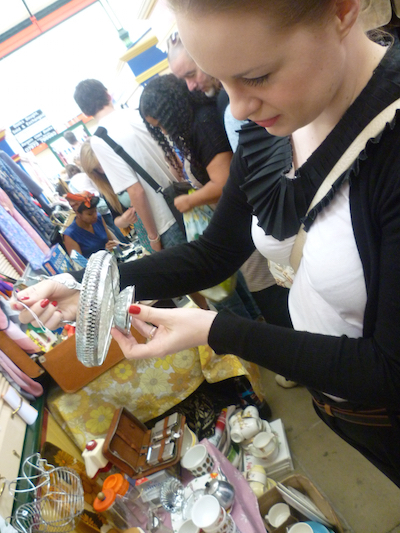 Caroline examining a potential purchase at the First Birthday Bash Fair, 11th September 2011. She now trades as Shiny Shilling Vintage! 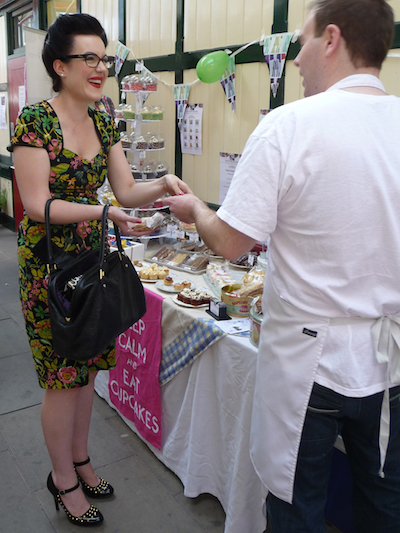 Stuart Thornley serves another happy customer at our Second Birthday Bash Fair on 9th September 2012. 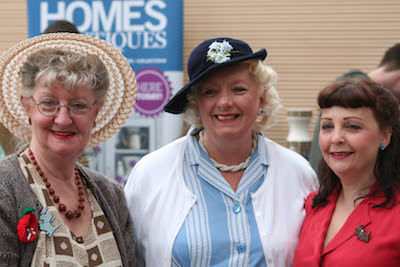 Jane, Lynne and Michelle at our Fourth Birthday Bash, 15th September 2014.